I hope everyone had a great holiday. It’s been awhile since I’ve blogged, but I took a short break to focus on my three ETSY stores. Most of you know that we have a 1970’s ranch home and it’s pretty much done as far as renovations and decorating goes, except the main bathroom. This is the hall/main bathroom that guests and myself use and let me tell you it isn't pretty, quite ugly in fact. I’ll show the before pictures once we start on the renovation, which I hope will start within the next few months, but I may get vetoed on the starting time. It’s a typical small bath, so I’m limited on size but that doesn’t mean it can’t be pretty, right? 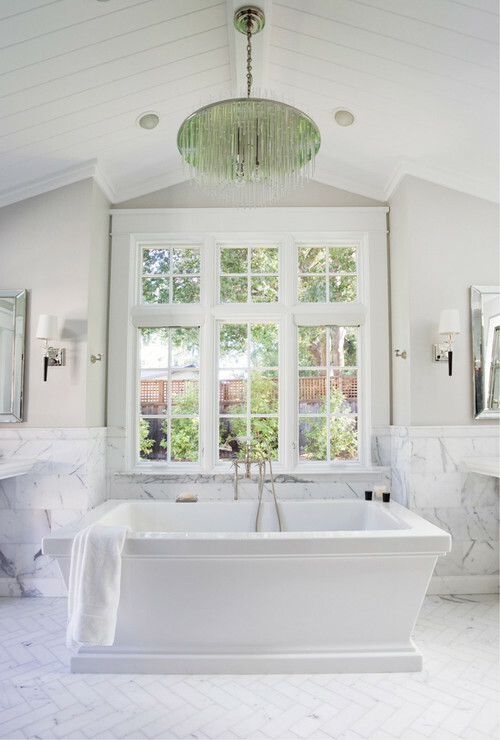 If I had an unlimited budget meaning I just won the lottery, here are some great baths I would love to have. 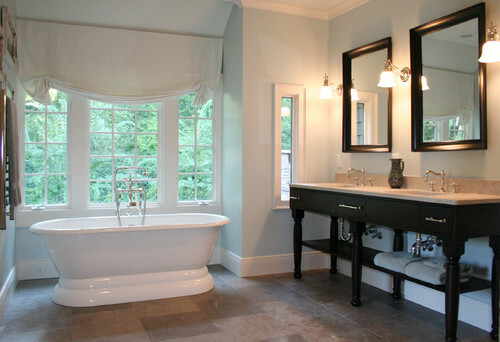 traditional bathroom design by los angeles design-build Zieba Builders, Inc.
Can you tell I love a freestanding tub? Here are a few choices for my bath. I love this tub, it’s in my price range and it’s a jetted tub! who would think a toilet could be cute, but this I think is, I love the molding around the base. I really want a marble tile floor but I may opt for ceramic if the price isn’t right. I’m thinking beadboard for the walls like I did in the dining room and we have a vintage sideboard that my brother gave us, that we will be converting into a sink vanity. I can’t wait to take a soak in that tub! Fabulous bathrooms for sure!! And that tub and toilet you picked is gorgeous! I am with you on the tubs, and dreamy bathrooms, but don't hate me for failing to see the beauty of a toilet. Thank you for widening my awareness though. You know now that I will think of you should I come across a pedestal base toilet. We are just stating a master bathroom remodel. I really like the toilet you posted. ( I know that sounds funny)! Can you tell me who makes it and what the model is. Thanks. Can't wait to see when your remodel starts. Shower, is much warmer, less fuss and muss, private! 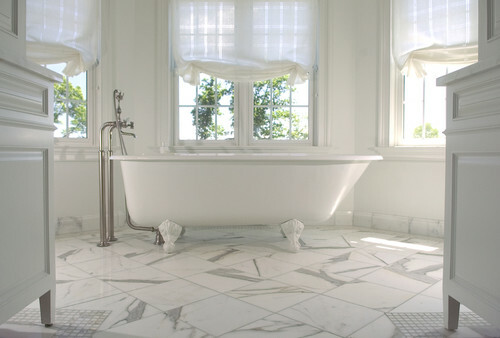 I do love the white on white, marble, the flooring tiles.